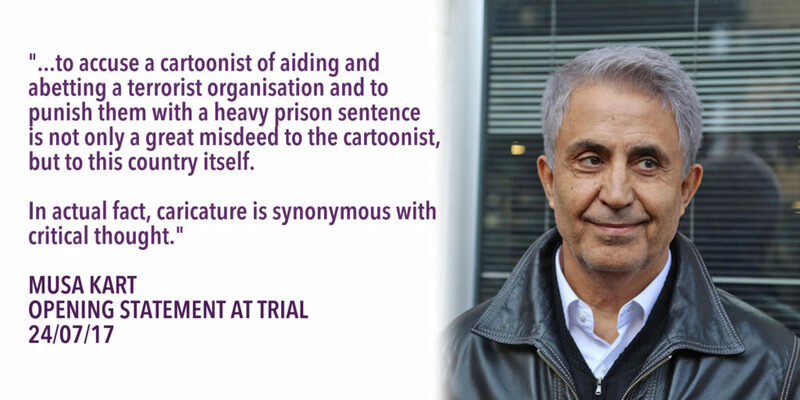 The celebrated cartoonist, convicted of “supporting terrorism”, recognised for his bravery by CRNI and Cartooning For Peace and currently the subject of an exhibit at the Maison de Dessin du Presse, Morges, has surrendered to authorities at Kandıra Prison. CRNI is saddened to report that our cherished friend and colleague, past winner of our Courage in Editorial Cartooning Award Musa Kart is once again a prisoner in Turkey this evening. Musa posts to Twitter shortly before turning himself in. As recently as the beginning of this week Musa and his colleagues were hopeful that the Turkish police and prosecution service could be convinced to wait until the appeals on behalf of all the various co-accused staff from Cumhuriyet newspaper were heard (see their press conference below). As readers of our site will recall Musa previously spent nine months in illegal pre-trial detention on charges pertaining to the support of terrorism in 2016/17. He will now go back behind bars for another year and sixteen days, having been found guilty of one of the charges levelled against him in 2018. He has since retired from cartooning , preferring to spend time with family. We categorically condemn the unjust criminal prosecution of Musa Kart. This is the climax of a fifteen year campaign of intimidation and persecution on the part of President Recep Erdoğan who has long harboured enmity toward Musa and indeed all critical voices in the Turkish press and media. Reporter Sans Frontières’ latest index places Turkey 157th out of 180 nations and says it remains the biggest jailer of journalists in the world. We urge all concerned with press and media freedom to join in demands for the immediate release and total exoneration of Musa Kart and all his colleagues. Musa bids his wife & family farewell. Cartoonist #MusaKart seen in video saying goodbye: "Farewell to all!" It's a sad day for #pressfreedom in #Turkey. We are delighted to have been recognised by Index on Censorship, receiving their Freedom of Expression Award for Campaigning. Deputy Executive Director Terry Anderson accepts the award on our behalf. Our thanks to those who made the nominations, the judging panel and the staff at Index. CRNI will now commence a year’s fellowship with them. More to come on that in the months ahead. Our sincere best wishes to the other organisations nominated in our category, all doing fantastic work and each a worthy winner. An exciting initiative for the promotion of under-represented cartoonists and celebration of their work. United Sketches, the organisation for refugee and displaced cartoonists established by our friend and colleague Kianoush Ramezani, has announced a new cartooning award dedicated exclusively to women. The Prix International Des Dessinatrices De Presse has been created in consultation with a committee of women cartoonists, including CRNI supporter Ann Telnaes, and will be judged by an all-female panel from across multiple professions. Cartoonists are invited to submit work on the themes of “Climate Change” and “Equality”. The deadline is August 31st 2019. Full details of how to submit cartoons, the judging process and future plans for the cartoons are available online. Generally speaking CRNI does not concern itself with the vital but very crowded field of international cartoon contests, festivals and prizes. However as a human rights organisation we recognise absolutely the need to address inequality wherever it exists. In short, women’s rights are human rights. Unlike some we reject the contention that goodwill and meritocracy alone will redress the imbalance in a profession that remains stubbornly male. Affirmative action is required. We commend United Sketches in their effort and wish those entering every success. Today CRNI has written to the Supreme Court of the State of California as cartoonist Ted Rall, formerly of the LA Times, seeks to overturn an “anti-SLAPP” ruling that prevents him from pursuing legal action against his former employer for defamation and unfair dismissal in 2015. 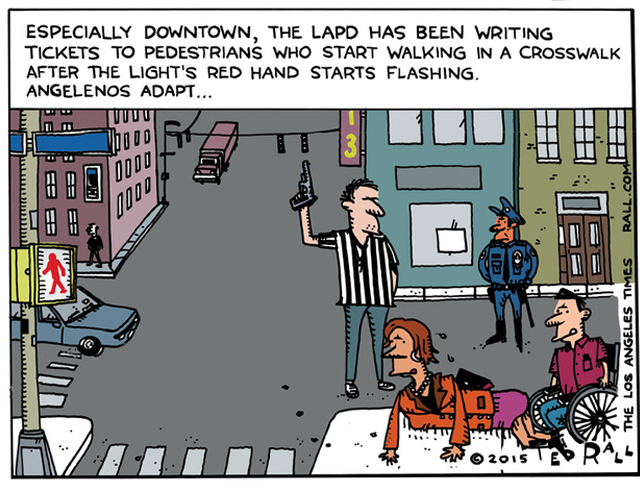 Ted Rall cartoon, used with permission. As we reported at the time, Rall was fired after a poor-quality audio recording of his being ticketed for jaywalking fourteen years prior was apparently taken from LAPD evidence and passed to his editors as a pretext for disciplinary action. Rall went on to contend that the Los Angeles Police Protective League, which welcomed his firing, influenced the paper’s decision. The LAPPL was at that time heavily invested in a private equity fund that was the major shareholder in the LA Times‘ publisher, Tribune Media. 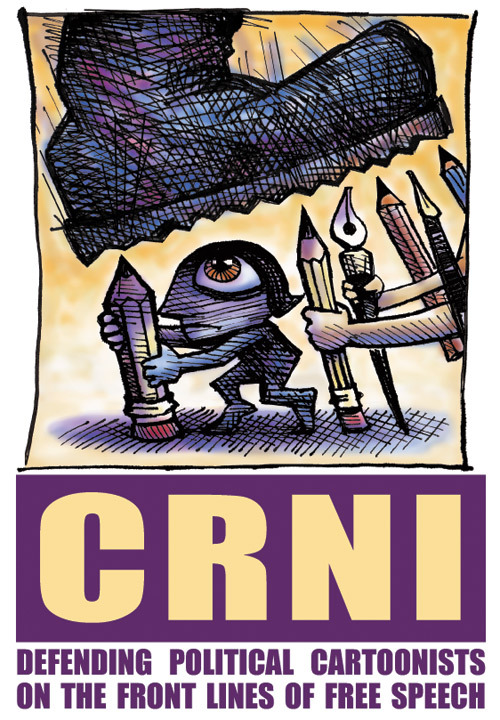 Cartoonists Rights Network International (CRNI) is a human rights organization working in defense of editorial, political and other cartoonists whose work leads to direct threats against their life, limb or livelihood. Often this involves cartoonists from oppressive theocracies where blasphemy or mere disrespect is a matter of grave consequence. Far more common, however, are instances where cartoonists suffer abuse inflicted with the instruments of authoritarian regimes: the military or police, party loyalists, unduly censorious statutes or heavy-handed legal action. In recent years the cases we champion have been largely in Africa, Asia, the Middle East and Central & South America. However, it is not unheard of to find a cartoonist in trouble in Australasia, Europe or North America, especially in an era when fewer and fewer professionals cartoonists have the backing of a newspaper or other large media player. Even in the USA, where First Amendment rights are regarded as inviolate, we have seen cartoons being withdrawn from circulation or cartoonists dismissed due to pressure applied from the ground up (organized displays of “offense” on social media) or top down (corporate interests or political cronyism). Our organization is small, but whenever possible we seek to intervene on behalf of the cartoonist in trouble, which may mean assisting in their legal defense, relocation, or simply making representations to the relevant authorities. This year Index on Censorship recognized our work, nominating us for their Freedom of Expression Award in the “campaigning” category. [This case] alarms us first and foremost because of how similar certain aspects appear to those of others we have followed in locations such as Turkey, Malaysia or Equatorial Guinea. In each of these places a cartoonist has been the recipient of our annual Courage in Editorial Cartooning Award after being subjected to campaigns of intimidation and harassment from police, generally based on fabricated or exaggerated evidence. Of course we recognize that Mr Rall’s case differs in the scale and gravity of the alleged criminality at its heart, (neither jaywalking nor the allegedly exaggerated blog post are acts of sedition) but the intent and effect of the ensuing events have produced alarmingly similar results. That a freelance cartoonist could be expected to pay the legal fees of one of the country’s largest and most powerful news outlets seems an injustice so skewed as to be clearly intimidating to other writers and artists. That the incident involves the police could be construed as a further warning against challenging the authorities. Those in positions of power have seized upon an opportunity to silence a critic and serious, perhaps irreparable, damage has been done to the career of a popular and acclaimed cartoonist. CRNI understands the court’s solemn legal obligations. We also understand that all media accounts, from sporting events to complex legal cases, involve some degree of subjectivity, and that different parties will inevitably interpret the same situation in differing manners. It is especially within those gray areas that we seek to ensure fair treatment. Mr Rall did not misrepresent the basic fact of his arrest for jaywalking. His cartoon and blog were based upon facts and, predictably, infused with opinion. If they were overly acerbic or emphatic in the expression or interpretation of those facts and opinions then, to some degree, that is only what Mr Rall was, or any editorial cartoonist is, employed to do. He is entitled to mount a rigorous legal defense of his reputation. In our view the role of the political cartoonist today remains unchanged; they are a societal safety-valve, expressing dissatisfaction about political ineptitude, corporate malfeasance, international strife, all the various injustices and irritants of the world in a fashion that is at times blunt, even vulgar, but ultimately harmless. The cartoonist should provide the opportunity for the reader to have a rueful chuckle about the state of affairs as they stand, communicating an idea in a direct fashion that is consumed and processed in a matter of seconds. It is this immediacy that gives the cartoon its sensation of impudence. To read an essay takes time and its line of argument can be picked over. A cartoon arrives in the mind’s eye too fast for analysis and can feel like a blow, particularly if it belittles a cow we happen to hold sacred. An editorial cartoon is not a bald statement of fact; it is an opinion piece. Nonetheless humor falls flat without veracity. Thus we look to cartoonists not for nuanced analysis of any particular policy but to reveal greater truths. It is for this reason that those in power have cause to fear them. Like virtually no other profession, the cartoonist makes it their business to remind the citizenry that the emperor is wearing no clothes. We humbly ask the court to take these points into consideration as it deliberates upon the petition for review before it. The letter is signed by President Joel Pett and Executive Director Robert Russell on behalf of our board of directors and regional representatives. We note the efforts of other freedom of expression and cartoonists’ organizations in this regard – such as our colleagues at AAEC – and join in their sincere trepidation regarding the precedent that could be set should Rall’s petition fail to convince the Californian Supreme Court. Our organization’s work has been recognised in the “Campaigning” category by the UK-based anti-censorship non-profit. We are delighted to announce that CRNI is one of a quartet of international campaigning organizations selected in this year’s shortlist, drawn from more than four hundred crowdsourced nominations. Full details of all fifteen nominees across four categories can be found in Index on Censorship’s release to the media (below). Winners will be announced in April and thereafter enter a fellowship program with support and training provided throughout the following year. It’s worth noting that this is not the first time Index on Censorship have shortlisted a name from the world of cartooning. In 2017 the exiled Chinese cartoonist Rebel Pepper was made a fellow in recognition of his satirical art. 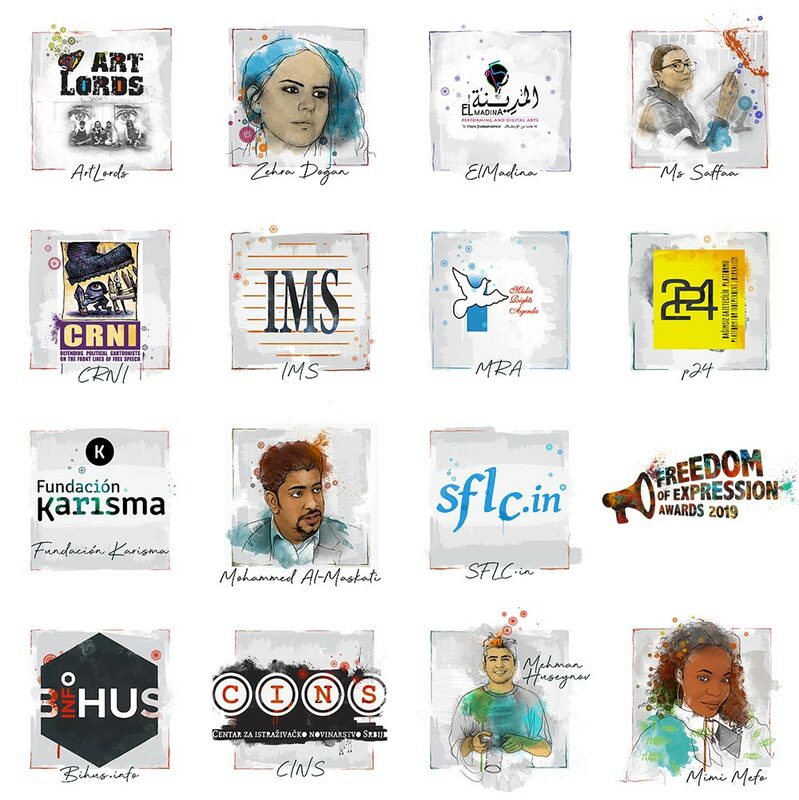 Look for more announcements about the forthcoming Freedom of Expression Awards on their dedicated webpage and via Index on Censorship’s social media.